FOR IMMEDIATE RELEASE: Portland, Maine (April 18, 2018) – New England Fights (NEF) returns to Aura in Portland, Maine with its next mixed-martial-arts event, “NEF 34: Home of the Brave,” on Saturday night, June 16, 2018. Earlier today, the fight promotion officially announced a professional featherweight bout for the card. Aaron “Relentless” Lacey (5-1) is scheduled to face Da’Mon “The Diamond” Blackshear (4-1). 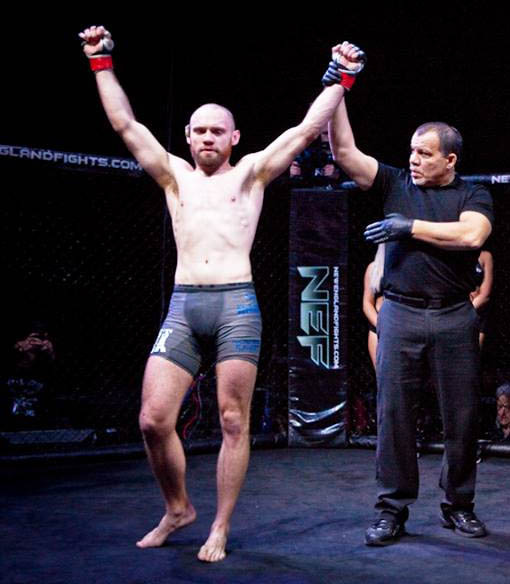 After suffering the first loss of his professional career in late 2017 – a doctor stoppage due to a cut on his head during a bout in New Hampshire – Lacey bounced back this past February with a big victory at “NEF 32″ in Lewiston, Maine. He came out aggressive in the first round against veteran Josh Parker (6-10), forcing Parker to tap late in the first-round to a rear-naked choke. And while it certainly was an impressive win for the 2016 NEF Fighter of the Year and product of Young’s MMA, Lacey felt that he had more to showcase for his fans. He will get the opportunity again on June 16 against Blackshear. Based out of Fayetteville, North Carolina, Da’Mon Blackshear began his MMA career in the fall of 2014. He put together a stellar amateur record of 7-1, capturing two championships in the southeastern region of the country. Upon turning professional, Blackshear, a Brazilian Jiu-Jitsu purple belt, has taken three of his four pro victories by way of submission. He has earned gold in numerous submission-only grappling events, regularly defeating black belts and larger opponents. Blackshear serves as a coach of Team R.O.C. in Fayetteville. NEF’s next mixed-martial-arts event, “NEF 34: Home of the Brave,” will take place at Aura in Portland, Maine on Saturday, June 16, 2018. Tickets are on-sale now online at www.AuraMaine.com. New England Fights (“NEF”) is a fight events promotions company. NEF’s mission is to create the highest quality events for fighters and fans alike. NEF’s executive team has extensive experience in combat sports management, events production, media relations, marketing, legal and advertising.